(18 km E of Rainbow Lake). (12 km NE of Whistler). 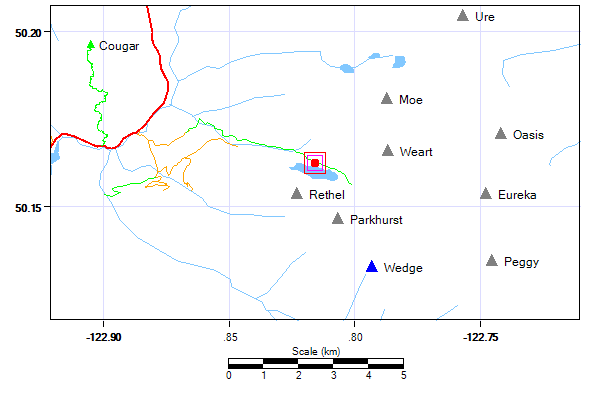 (4 km NW of Wedge Mountain). Maintained alpine hut used for ascents of Wedge, Weart, etc. This hut is located at 1913m (6277ft) on a knoll at the northwest corner of Wedgemount Lake. About 200' above the lake. There is space to sleep 6 and an outhouse. The hut has some furniture inside, but little in the way useful items like lanterns, pots, etc. The location is windswept and usually not affected by accumulating snow. 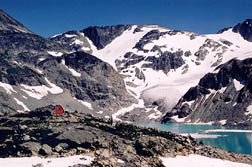 Access to the hut is usually via the Wedgemount Lake Trail, a 2-4 hour grunt up from the Whistler valley. Seven or eight wooden tentpads were installed by BC Parks in late 2006, along with a new pit toilet and a new hut at the main campsite. A smaller campsite (several gravel tent sites, 1 toilet) is located 400m further east at the end of a stone pathway. As Serguei said, the door jams shut so it can seem like you're locked out when you try to open it. This can be unsettling when you arrive all wet and wish to get out of the elements. Maybe use the shovel as a pry if needed. Don't bother turning the knob since there is no latch. Spent two nice nights there. Those leaving need to apply force to shut it, consequently next party will have trouble opening it. In winter the ice adds more difficulty. The extensive construction project of October, 2006 created seven or eight new tent sites (some are raised wooden platforms, others are packed crushed gravel), improved trail drainage, trail remediation, a new outhouse, a trail and park sign, a helicopter pad, and a new (small) hut. Finally, but maybe most annoyingly (? ), there is a very strong digital cell signal at the campsite--no need to haul up the satellite phone here anymore! From BC Parks website (http://www.env.gov.bc.ca/bcparks/explore/parkpgs/garibald.html): "Campground and trail construction will be ongoing at Wedgemount Lake from Monday, September 11 until mid-October, 2006. Intrusion will be minimal but visitors should expect occasional use of generators and helicopters. Please avoid camping in the construction area and respect the crew's work space (especially when involving helicopters). Stay clear of helicopter loading / unloading area. There will still be ample tent spaces available and the trail up to the hut will not be affected."